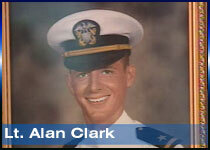 Lieutenant Alan Clark was in the last Navy plane shot down in Vietnam; remains identified last month and he was buried at Arlington National Cemetery. He was the love of her life. Her husband. Her soulmate. Her everything. "I just didn't want him to go," says Tonya Clark. Alan Clark went. He went to Vietnam. And before it was all over, the A-6 Navigator based out of Whidbey Island Naval Air Station, would make history. His shipmate from the USS Midway would write about him in his book: "I felt the tears pouring down my cheeks," Jim Horsley says. Alan's wife would be haunted by the question: What if? What if the war had ended just two weeks earlier? January 10, 1973. Lieutenant Alan Clark's plane was shot down. It was the last Navy plane shot down in the war. Pilot Jim Horsley searched for the two Navy flyers. "With my oxygen mask on, I'm sobbing tears," says Horsley. They found nothing. Two weeks later, the Vietnam War ended. Troops started coming home. "I remember when the guys came back. It was so hard seeing them flying in and they had the missing man formation and that was just so difficult," says Tonya. For the next 31 years, Navigator Alan Clark and his pilot remained missing. "When you go to war it's a hard thing," says Clark. A hard thing leaving your wife -- your pregnant wife -- to go to war. Tad Clark was just two months and 10 days old when his father was killed in Vietnam. "He never got to hold him and see him!" Tonya said. Tad never met his father, but he would do something that would have made him proud. He followed in his footsteps. Tad Clark is an Air Force Captain stationed in Germany. "He just wanted to be a fighter pilot all of his life," says Tonya Clark. Tad Clark is 31 years old. It's how long his dad's been missing. Tonya has spent all these years living a quiet life in Lynnwood. She's a piano teacher. Tonya always had faith that one day, the military would find Alan. And they have. Alan Clark's remains were finally found and identified through DNA. Last month, his shipmates and family helped bury Navy Lieutenant Alan Clark, the recipient of the Purple Heart, at Arlington National Cemetery. "You just can't help by feel grateful and say 'Oh God this is so amazing' It is amazing," says Tonya Clark. Tonya's soulmate; her best friend; her everything, is home. The thousands of personal tragedies that comprised the Vietnam Conflict were recently brought into distinct focus for Ukiah resident Adrian Rodriguez. Rodriguez, a veteran of the Navy who served "in the tail end of the Vietnam era" but not in Vietnam, has been wearing what is known as a "POW/MIA bracelet" for about five years, and just by chance he learned this year that the remains of the man whose name is on his bracelet had been discovered and brought home to be buried in Arlington Cemetery in Washington, D.C. The man was Lieutenant (jg) Robert Clark, an Air Force navigator, and he had been missing since 1973 when his plane was shot down over Vietnam. "There were two jets and they were flying cover for some bombers and then they saw a lot of surface-to-air missiles coming up on the way out," Rodriguez explained. "The one fighter made it back, but Clark and his pilot didn't. They just didn't show up. The other jet hung around and went back at 15,000 feet, but they couldn't see any fires or signs of crashes. "They never heard from him again," Rodriguez continued. "He disappeared into the jungle, just a few weeks before the ceasefire." Clark left behind a wife and a baby son. "He never got to see him grow up," he said. Rodriguez, a member of the American Legion, had signed up for a Web site called "military.com" which sends out military news to veterans, and when he was on the site he happened to see a "little blurb on a story" about two Vietnam veterans being found. "I was thinking, Yeah, it would be nice if it was Robert Clark but what chance would that be,' and then I clicked on the link and it was," Rodriguez said. "It was the same guy!" 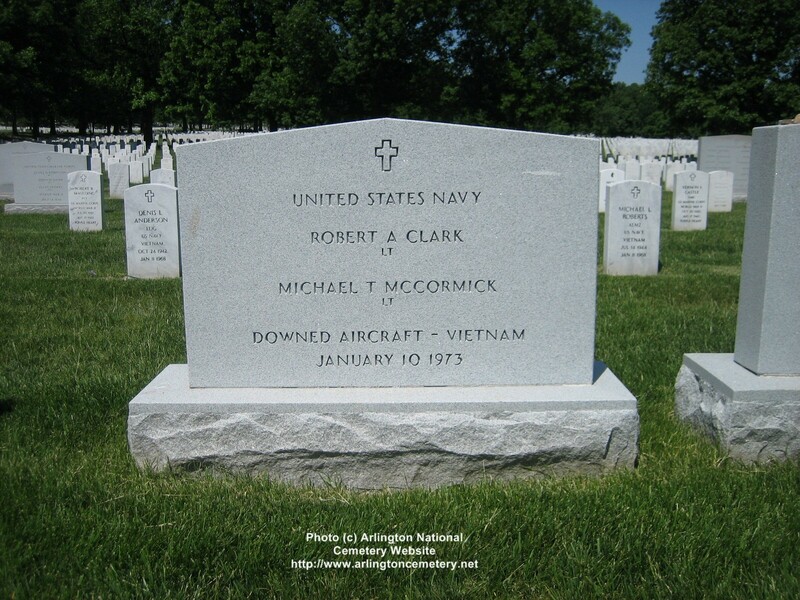 According to the United States Department of Defense, Clark and his pilot, Lt. Michael McCormick, disappeared the night of January 10, 1973, in their A-6A Intruder. They volunteered to go on a mission to hit surface-to-air missiles in the Nghe An Province in North Vietnam, and their ship, the USS Midway, was scheduled to return home the next day. But of course Clark and McCormick were not found, though the search went on for four days. However, in July 1991, U.S. researchers found a "data plate" in a Vietnamese military museum that matched Clark's plane, as well as photos of a crash site in another museum. This site and its location was verified by Vietnamese records, and four field investigations and one excavation were carried out by joint U.S./Vietnamese teams at the site of the crash, and during one of these a witness to the crash came forward with remains he had taken from the downed plane. In 2002, additional remains were excavated. Skeletal analysis and mitochondrial DNA tests confirmed it was the missing airmen. Clark was buried January 9,2004, at Arlington National Cemetery. The service was attended by his wife, Tonya Clark (who never remarried), his son, Air Force Captain Tad Clark, and many of his squadron mates from Attack Squadron 115. Rodriguez contacted Clark's wife and son to tell them about the bracelet he had been wearing. "I told Tonya Clark about when the (Vietnam Memorial) Moving Wall came here I volunteered to help stand guard watch at night," Rodriguez said, "and I found his name on the wall and it just surprised me, how seeing his name on the wall there really affected me, even though I had been wearing this man's bracelet, seeing his name in front of me on this tribute to him and the other people captured or killed. "I'd never met him, and I don't know who he was," he added, "but he served his country -- he's one of those people who protected us -- and he's at home now, and his family knows now what happened." Rodriguez said he plans to send his bracelet to Tonya Clark, to which she replied she would be "most honored" and that it would "be placed in a most special place of honor next to the flag that was presented to me at the memorial service." She added that "those who are remembered live on forever." Clark's son wrote to Rodriguez that "I too have been wearing my father's bracelet for more years than I can remember. "I have now placed that bracelet in a special place in my home as my dad is back in America...he is no longer missing...my dad is finally home." In a poem the younger Clark wrote for his father's memorial Web site, he stated "It's because of His peace/ I can confidently say/That in fact I had two Fathers.../As the Lord never left me and my dad has affected me each passing day!" One of Lieuteant Clark's shipmates from Vietnam, Jim Bragdon, was also inspired to write a few words about his lost comrade. Bragdon told about how the navigators and pilots would "harass" each other whenever a shoddy landing was made or a coordinate botched. "I remember the day he and Mike did not return," he wrote, "no one harassed anyone that day. We had all lost two comrades and friends, so close to the end of everything." At 0145 hours, on 10 January 1973, Lieutenant Michael T. McCormick, pilot; and then Lieutenant (jg) Robert A. Clark, bombardier/navigator; comprised the crew of an A6A that departed from the deck of the USS Midway as the lead aircraft in a flight of two to provide support for B-52 airstrikes and with 3 targets assigned to them. The flight was due over the target area by 0243 hours where the weather was overcast with cloud bases 15,000 feet. The target area was located in a fairly heavily forested valley between two mountains approximately 21 miles inland from the coastline and 28 miles northwest of Vinh, North Vietnam. At 0255 hours, other aircraft in the flight heard a radio transmission from the lead Intruder reporting intense surface-to-air missile (SAM) activity aimed at the various aircraft in the flight. Three of the missiles were fired at the Intruders and 12 at the B-52s. The crew of the #2 Intruder reported the boosters of the missiles were diffused by the overcast and proved extremely distracting. On egress (departure), the pilot also reported additional missile boosters sighted along with the glow from the B-52 bomb impacts. The #2 Intruder coasted out and planned to orbit off the coastline until the lead aircraft rendezvoused for the return flight to the USS Midway. When the wingman was unable to establish radio contact with Lead, he retraced their flight path at an altitude just under the cloud cover. Likewise, between 0300 and 0320 hours as he retraced their route, he made numerous radio calls on guard, the emergency channel. During his visual search, no ground fires beyond those caused by the raid were seen and no enemy reaction was noted. Other aircraft crew members reported hearing a 3 to 4 second emergency transmission that sounded like an Electronic Counter Measures (ECM) alert; however, no voice transmission was heard. A search and rescue (SAR) mission was immediately initiated and was conducted from the time of disappearance through 14 January with negative results. At the time the formal search effort was terminated, both Michael McCormick and Robert Clark were listed Missing in Action. Nearly 31 years to the day after his A-6 Intruder was lost over North Vietnam, the remains of a Navy pilot from North Hollywood, California, were buried Friday (8 January 2004) in Arlington National Cemetery. The ceremony ended a longtime mission to find and bring home the remains of Lieutenant (jg) Robert A. Clark, who left behind a widow, Tonya, and a 2-month-old son he never got to meet. "He was a real nice guy, a good guy to be around, a little surly. He didn't care what you thought about him," said retired Navy Commander. Jim Bragdon, who served with Clark aboard the USS Midway, where the pilots shared an easy-going rivalry and camaraderie. "We weren't really afraid and neither was he. The feeling was, I'm a professional and I'm not going to be shot down." Clark's last mission is recounted in a January 2003 Air Force Print News Service article about his son, Tad, who grew up to be a fighter pilot stationed in South Korea. It was early January 10, 1973 -- just a month before the cease-fire between North and South Vietnam -- when Clark, 26, and pilot Lieutenant Michael McCormick signed on for a volunteer mission to support B-52 bombers targeting a heavily forested area in the Nghe An province. More than a dozen surface-to-air missiles, along with anti-aircraft rounds, were fired at the squadron, and Clark and McCormick's plane disappeared. For four days, crews flew searched unsuccessfully for the downed plane. On Jan. 14, 1973, they were listed as missing in action. Thousands of men were listed as missing in action, but serious recovery work was delayed until 1985, when the military was allowed into South Vietnam, explained Larry Greer, spokesman for the Defense Department's POW-MIA office. It took several more years before investigators could reach North Vietnam, where Clark was lost. In 1991, U.S. researchers discovered a data plate from Clark's A-6 in a Vietnamese military museum. Then, in another museum, they found photographs of a crash site that matched the location where the plane went down. Using Vietnamese war records, U.S. authorities confirmed that it was Clark's aircraft. Between 1993 and 2002, U.S. and Vietnamese teams conducted four field investigations and one excavation that recovered some remains. During one of those visits, a witness to the crash gave researchers remains he said he recovered from the site. In May 2003, researchers in the Central Identification Laboratory used skeletal analysis and DNA to finally confirm the remains belonged to Clark and McCormick. Their remains were buried in Arlington Cemetery. The Department of Defense withheld the hometowns of the pilots' survivors. Some 88,000 Americans are missing in action from all conflicts, with 1,871 from the Vietnam War. In Vietnam, the military posts ads in local newspapers describing the search for soldiers as a humanitarian effort and asking for information on burial and crash sites. "For us, the importance is it demonstrates a national commitment," said Greer. "When you send your son or daughter off to war, they are not forgotten. The families need to know, 50 or 60 years later, we'll do what we can to bring them back." While the Navy's Blue Angels precision fighter jet team streaks over Seattle during Seafair in August, the rival Air Force "Thunderbirds" will be flying into history, having recently named an F-15 fighter-jock with the call-name Fifi to join them next year. Selected to the 2006 team along with Captain Nicole "Fifi" Malachowski -- the first female pilot to fly in a military demonstration jet team -- will be her good friend and fellow 1996 Air Force Academy classmate, Captain Tad "TC" Clark. An F-16 fighter pilot now based in Germany, Clark, 32, is making good on a military career inspired by a father he never met. He was 2 months old when his father, Lieutenant ( j.g.) Robert Alan Clark, a 26-year-old Whidbey Island-based Navy aviator, was lost during his squadron's last mission over North Vietnam on January10, 1973. "Although he was never here in a tangible sense, he certainly had a tangible effect on my life," Clark said Friday by phone from Spangdahlem Air Force Base, Germany. "I have always been very touched and impressed with my father's commitment, because he made the ultimate sacrifice during an unpopular war," said Clark, who graduated in 1991 from King's High School in Shoreline. At the Christian-based private school, he worked hard to earn appointment to the Air Force Academy. Clark's mom, Tonya, who never remarried, kept alive her husband's memory, holding to her deep faith. Clark's father's friends took him under their wings, including one who became a Blue Angel. After becoming a pilot himself, Clark, who has served with NATO and in South Korea, Turkey and Israel, carried two things as he flew -- a piece of paper in his flight suit with a Bible verse (Psalm 91) and a Vietnam War MIA bracelet emblazoned with his father's name. Last year, Clark removed the bracelet. On January 10, 2004, in a snow-covered Arlington National Cemetery, he stood with his mother, relatives and a host of his father's graying colleagues, in the presence of the man he never met. In summer 2003, Lt. j.g. Clark's remains were unearthed by a joint U.S. and Vietnamese recovery team in Vietnam. Months of extensive testing verified the identity. "We all gained a lot of closure. He no longer was a name on the Vietnam War memorial wall, but a soldier returned to American soil," Clark said. Clark was born Oct. 31, 1972, in Oak Harbor -- a half-year after his father left for Vietnam. Lt. j.g. Clark was a navigator/bombardier in two-man A-6 Intruder jets from Whidbey Island Naval Air Station's VA-115 squadron, flying from the aircraft carrier USS Midway. On an overcast Jan. 9, 1973, off Vietnam, Clark's father and Lt. Michael McCormick, the pilot, volunteered for a mission to protect Air Force bombers. Radio contact went dead. Search-and-rescue missions found no crash sites. What happened remains unclear. Reports released later spoke of intense surface-to-air missile fire that day. The Midway the next day began its return to the States. Seventeen days later, a cease-fire agreement was signed with North Vietnam. Tad Clark, who was drawing jet planes with crayons without prompting at age 2, wanted to be a pilot since he could realize what one was. Clark set clear goals, earning a pilot slot at the academy, then becoming an F-16 fighter pilot. Clark and Malachowski, who were soaring-glider instructors at the Air Force Academy, were selected for the two-year Thunderbird assignment along with Capt. Ed Casey from Luke Air Force Base in Arizona, culled from a large field of candidates after months of testing. Malachowski, a Las Vegas native, will fly the No. 3 right-wing position. Clark will be highly visible to the public as the No. 8 pilot, meaning an advance F-16 for media and celebrity flyups, and serving as team spokesman. The new pilots will report to Nevada's Nellis Air Force Base Nov. 1 to train in the F-16s, and be ready for a new touring schedule in March. Clark isn't surprised that Malachowski, who is married and based in England, became the first female demonstration pilot in the 52-year Thunderbirds history. Recently returned from a Middle East deployment, Malachowski "has been to war and is very competent and capable," Clark said. The Navy's Blue Angels, formed in 1947, have not named a woman among their demonstration pilots, though women have been part of each team for decades. Lt. Cmdr. Tarah Johnson, for example, is the Blue Angel's flight surgeon. Malachowski's selection drew applause not only from her male commanders, but in Congress, especially among female legislators, when it was announced last month. She was named days after the House hotly debated a proposal to further limit the role of women in the military. The measure was defeated. Clark expects more female aviators will fly with both teams in the future. Thunderbird pilot candidates need at least 1,000 flying hours to even begin to be considered for the selection process. That record can take seven to eight years to build, about as long as U.S. women have been flying fighter jets, he said. "We're just now beginning to see them emerge," he said.